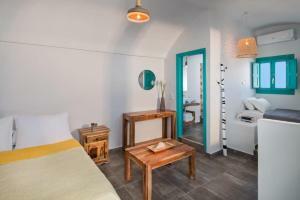 The coastal resort Nissia Apartments is located directly opposite the peculiar black sand beach of Kamari. 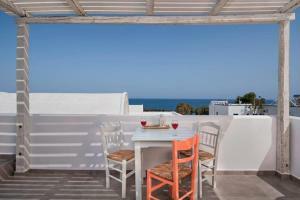 It offers magnificent views of Santorini's sunrise and the Aegean Sea. 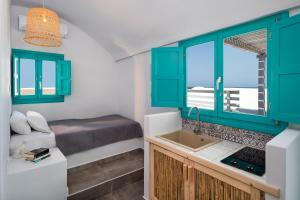 This studio includes a seating area, a kitchenette and a private balcony or terrace. Apartment of 2 floors with a second bedroom on the top floor. 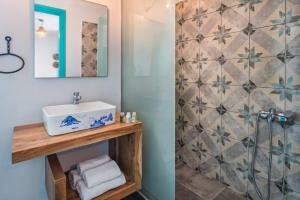 Spacious suite with a private veranda, a spa bath, a plunge pool, a living room, and a spacious bathroom with a shower. The hot tub does not heat up. This suite has air conditioning, a seating area and a balcony. It also has an outdoor hot tub. This spacious suite has a private balcony with a spa bath and mini-pool, a living room and a spacious bathroom with a shower. The hot tub is not heated. 2 level apartment with 2 bedrooms, 2 bathrooms, living room and kitchen area. Apartment with a balcony, a living room, an open-plan kitchen and a bathroom with a shower. This suite has a balcony, seating area and kitchenware.